You’ve probably seen the tutorials online lately of cute floral monograms that people have been making and I’m apparently very susceptible to simple DIYs of wall art because last week I made one for my friend Emily’s birthday. My main inspiration for this present was this post by The Sassy Life (whose blog name I love and live) but I stumbled across some complications during my own process, which I’ll expand on later in this post. All the materials that I used are listed in the graphic below, as well as a glue gun! It was really simple to round up everything, I just popped over to the Dollarama by my house and honestly my biggest struggle was that pure red flowers weren’t in stock but they had like 5 varieties of fuchsia. No one needs that much fuchsia. In fact, I just lied to you guys, my biggest struggle with this DIY was that all the tutorials that I watched and read kept on talking about a cardboard letter box. Apparently it’s a letter made of cardboard that you should slice the top off so that you have a nice box to put all the flowers in. To save you all some time, Dollarama does not have this. Unless the initial you want is I, or O (with no inner hole) I would skip this store and maybe attempt Michael’s, but even my cursory search on their site produced no mythical cardboard letters for purchase. Instead, I just bought some cork boards (the small thing square tiles not the big ones that you put on your wall) and I figured that it would be sturdy enough to act as a base, which I will just cut later. Okay and it’s at this point in the post that you realize I forgot something crucial, which was taking pictures of all the steps in this DIY process. My bad. Please love me, I’ll remember for the next one! But this tutorial is so simple you can probably pull it off without pictures. Put on some tunes or television while you do this, it’s pretty low key. Using the bristol board sketch out the letter you want to make into a floral monogram. Cut out the letter and trace onto the cork board. Cut out the cork board with either scissors (which creates a roughish rustic edge) or an exacto knife (which I did not find or remember to buy). You may also need two layers depending on how thick your cork board is. I glued two layers together and you can even reinforce with cardboard! Glue on the bristol board stencil onto the back if you want it to look cleaner. Don’t do what I did which was press it on from the outsides because then there was a nice bump that had to be cut in order for it to lie flat. Take all the flowers off their stems. Because they’re fake, you should be able to just pull it off, along with the leaves. Snip off the protruding stem-thing on the backs of the flowers so that they can be glued down flat. 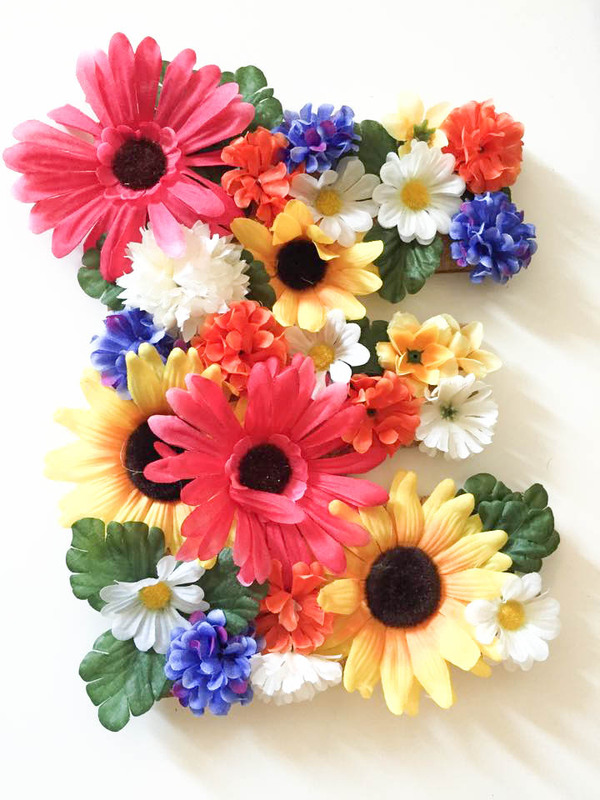 Arrange your flowers and leaves as you like and then go crazy with the glue gun. Put on your wall or your shelf or cuddle it at night, no one is judging. I’m actually so bad at this process that I didn’t even take a picture of the final product, I made the birthday girl do it.